Thanks so much to: http://wheelmummy.wordpress.com/2012/06/25/the-beautiful-blogger-award/ for the beautiful blogger award. Here’s what you have to do! 1. 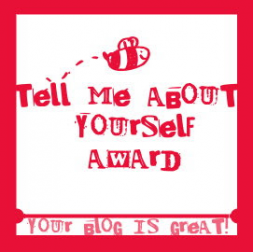 Include the award logo somewhere in your blog. 2. Answer these 10 questions, below, for fun if you want to. 3. Nominate 10 to 12 blogs you enjoy. Or you pick the number. 4. Pay the love forward: Provide your nominee’s link in your post and comment on their blog to let them know they’ve been included and invited to take part. 5. Pay the love back with gratitude and a link to the blogger(s) who nominated you. 1. What would you do if you won 5,000 pound tomorrow? ?Rent a large, luxurious RV and go on a much-needed vacation. 2. Best life time moment? ?The birth of my children. 3. Are you happy? ?I have my good days and my bad days. 4. Do you prefer Facebook or Twitter?I’m not a huge fan of either one, but I do like catching up with friends and family occasionally on FB. 5. If you could change something in your life what would it be.I would take better care of my health and take better charge of the health of my family. 6. What is your biggest vice/ bad habit in life ? ?My biggest vice is worry. 7. Can you note what you name a good point about you and also a negative point about you?? (after all no one is perfect. )A good point is that I am always available for my family. A bad point is that I tend to neglect doing some of the things I want to do in life. 9. What is your favorite flower?I love them all, but if I must pick it would be the rose! 10. What’s your biggest love in life?My biggest love in life is and always will be my family. And thanks to: http://terriskitchenuk.wordpress.com/2012/07/12/another-award/ for the tell me about yourself award, I appreciate it very much! 1. I’m terrible with directions. 3. I have very pale skin that burns easily. 4. I tend to procrastinate too much. 5. Ms. Pac-Man used to be my favorite video game. 6. I really enjoy science fiction movies and documentaries. 7. I love hosting parties, but haven’t done so in a long time because I’m humiliated by our cluttered family room! Thanks again to terriskitchenuk and wheelmummy! Posted by Createityourself on July 12, 2012 in Uncategorized and tagged awards, blog, blogging, nominations, tell me about yourself. Congrats on the Beautiful Blogger Award! First, congratulations on your award 🙂 I did laugh at your most embarrassing moment…. And thanks for nominating me for the beautiful blogger award. I’m looking forward to having a look at the other nominees’ blogs. It’s lovely to share like this. clutter happens! congats on the award! I would have a humiliating living room if I didn’t have regular massage clients in it…they keep me tidy! In that room anyway my bedroom is not so good! First, congratulations on your awards. I am a little behind in my reading so am just now seeing this. Second, thank you very much for the nomination for the Beautiful Blogger Award. I am honored and will most certainly check out the other nominees! Thank you! Put the lime in the coconut! It creeps. It crawls. It eats you alive! Catch me if you can…a reel expert can tackle anything. The good, the bad, and the downright hideous! It’s too hot to cook! Thank you for the award! Create it yourself fathers…a tribute. Garden Guests…Please don’t make yourself too comfortable!